The rise of Hindutva forces is tearing India apart along caste and religious lines as the country celebrates 71 years of independence from the British colonial rule. Hindu mobs are lynching Muslims and Dalits. 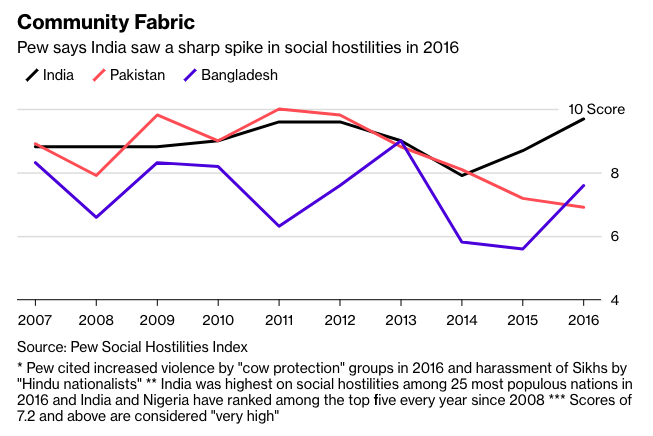 A recent Pew Research report confirms that the level of hostility against religious minorities in India is "very high", giving India a score of 9.5 on a scale from 0 to 10. Pakistan's score on this scale is 7 while Bangladesh's is 7.5. In recently published "The Raisina Model", British-Indian author Lord Meghnad Desai asks: "A country of many nations, will India break up?" The Hindu Nationalists who are blamed for deepening divisions are themselves divided on the key questions of caste, religion and trade. Professor Walter Anderson, co-author of "The RSS: The View to the Inside" raises the specter of "a battle between Hindutva and Hinduism". 1. Cow protection squads are killing Muslims and jeopardizing their livelihoods. The current agitation about beef eating and gau raksha is in the Hindi belt just an excuse for attacking Muslims blatantly. As most slaughterhouses in UP are Muslim-owned, owners and employees of these places are prime targets. 2. India has still not fashioned a narrative about its nationhood which can satisfy all. The two rival narratives—secular and Hindu nation—are both centred in the Hindi belt extending to Gujarat and Maharashtra at the most. This area comprises 51% of the total population and around 45% of the Muslims in India. 3. India has avoided equal treatment of unequal units. Representation in the Rajya Sabha (Upper House of Parliament) is proportional to population size. If anything, it is the smaller states that may complain about being marginalized, though so far none has. The larger states thus dominate both Houses of Parliament. It would be difficult for small states to object, much less initiate reform. In future, small states could unite to present their case for better treatment. Except for Punjab and Nagaland, there has been no attempt to challenge the status quo. In "The RSS: The View to the Inside", the author Walter Anderson brings out several areas which could lead to a split within the Hindu Nationalists. These disagreements have to do with low caste Hindus, Muslims and foreign trade and investment policies. 1. The leadership of the the Rashtriya Swayamsevak Sangh (RSS) is drawn entirely from the upper caste Brahmins. The RSS founder Golwalkar never spoke against the caste system. The RSS opposes affirmative action, called reservations, to benefit low caste Hindus. At the same time, they want to integrate Dalits and OBCs (Other backward classes of which Prime Minister Modi is a member) into the organization to promote Hindu unity. "..there will eventually be a battle between Hindutva and Hinduism. Hindutva emphasizes the oneness of Hindus, whereas ground realities are very different. Let me give an example. Following the egalitarian ideology, Tarun Vijay, an RSS ideologue and former editor of Panchjanya and Organiser, once led some Dalits into a temple in central India, where they had not been before. He was beaten up, but few in the RSS family vocally supported him. They kept mostly quiet. As one important RSS functionary put it to me, the key question is: how do we keep our organisation intact if we do move towards an egalitarian Hindu society?" 2. When RSS leader MD Deoras invited Indian Muslims to join the RSS, he argued that Muslims were mostly India-born, and therefore Indian. But he made the Muslim entry into the RSS conditional upon accepting India’s “historic culture”. RSS leaders argue that South Indian Muslims, or Indonesian Muslims are ideal Muslims. South Indian Muslims speak the regional languages; and Indonesia, a primarily Muslim country, has the Ramayana as its national epic. 3. Many RSS ideologues oppose Prime Minister Modi's policies of promoting foreign trade and investment. They view Modi's economic policies with great skepticism. The rise of RSS and its affiliates in India is deepening divisions in the country along multiple fault lines, the most important being caste and religion. The RSS leadership itself is not unified on how to deal with the divisions they have created and promoted. This situation has raised the social hostilities in India to very high levels. 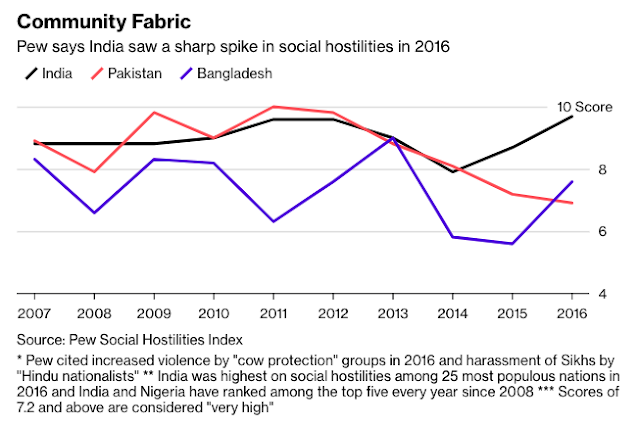 Pew scores social hostilities against minorities in India at 9.5 on a scale from 0 to 10. Professor Walter Anderson, co-author of "The RSS: The View to the Inside" has raised the specter of "a battle between Hindutva and Hinduism". And it has caused Lord Meghnad Desai, author of The Raisina Model, to ask the question: Will India break up? GOVARDHAN, India —The two young men at the leadership camp were soft-spoken yet assured, from well-off families, wearing aviator sunglasses and flip-flops. India has more than 600 million people under age 25, and they have greater access to technology and education than ever before. Yet millions have little hope of finding decent jobs, and a “bachelor bomb” of more than 37 million surplus men — a legacy of generations of a preference for sons and aborting female fetuses — threatens social stability for decades. Citizens are of paramount importance in democracies and institutions are established to protect their rights. Today, each pillar of our democracy is under attack. Our administrative structure is unable to operate impartially, the state of the judiciary is such that judges of the Supreme Court have said that democracy itself is in danger and we all know the state of the media. When the institutional pillars of a democracy lose their impartiality and transparency, the country becomes a victim of partisan politics. A former judge of the Supreme Court has said that “a society not vigilant shall lose its liberties”. Therefore, it is not enough for people to vote but it is equally important to hold the government to account. As long as these institutional pillars are independent, not only will democracy be secure but the country will also prosper. Public servants in institutions are striving to do their duty despite being constantly hindered. The Opposition is the conscience-keeper of the government. It’s unfortunate that it’s being described as a daldal, or a quagmire. There is lot of noise in the media and social media and we seem to have forgotten how to talk to each other. The nine o’clock news has become the noise o’clock news. We seem to have forgotten what the relationship between citizens, the media and a government should be. We have forgotten what the goals and responsibilities of governments are. Our country is the largest democracy in the world and its unique constitutional framework was decided by our great founding fathers, including B R Ambedkar. The Constitution placed limits on democracy precisely because, without limits, a democracy can very easily slide into anarchy and even tyranny. A democracy must also allow for and promote different political opinions within its polity. Therein lies its beauty. However, today differences of opinion lead to being labeled anti-national. Fingers are even pointed at those who who have been honoured with the Nobel Prize. I would like to draw attention to the Bhagawat Gita. In the 32nd verse of the 6th chapter, Lord Krishna tells Arjun that the sign of a true Yogi is one who treats everyone with equality and who finds his own happiness in the happiness of others and feels pain in their pain. Indeed, Ram Manohar Lohia wrote that seeking to establish equality is as important a goal as searching for the truth. However, today people are being divided on the basis of religion, caste, gender, region and language and the seeds of animosity are being sowed amongst them. Women must play a pivotal role in the development of any society but the state has failed to ensure even basic security for them. Lohia wrote that any war on poverty is a sham unless it is also a war on caste and gender discrimination. In other words, equality, not only before the law but within society, is of paramount importance.